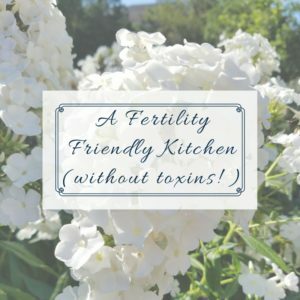 If you’ve been struggling with infertility you probably already know that many everyday toxins such as BPA and phthalates can cause infertility and miscarriage (if you don’t know, check out my overview post here on what the evidence says about different toxins and their effects on the reproductive system). Fortunately, when we eliminate or drastically reduce our exposure to these toxins, most of them clear out of our system quickly and we can substantially boost our chances of conception. Once you take these steps to clean toxins out of your kitchen you and your spouse will have greatly reduced the risks to your fertility. 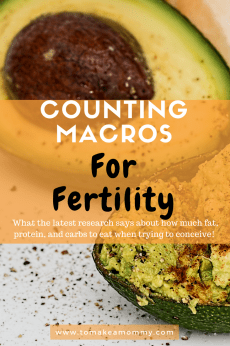 If you’ve stumbled upon this page and aren’t trying to get pregnant, the health of you and your family will still improve if you take these steps. Many of these toxins are also linked to birth defects when pregnant women are exposed, a variety of health problems in small children, and cancer in adults. What my cabinets look like now! 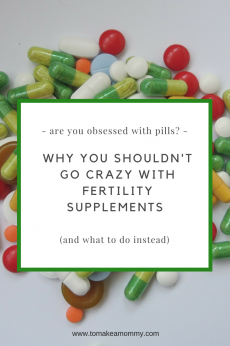 In my initial blog post on fertility-harming toxins, I gave you a big, long, scary list of chemicals to watch out for while trying to conceive. This is the first in my series of blog posts talking about ways to actually tackle this task so you don’t just spend your time worrying! 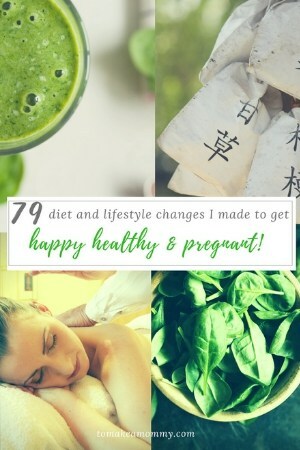 I’m starting with the kitchen because I believe it is the most important room in your house when it comes to preparing the body for pregnancy. 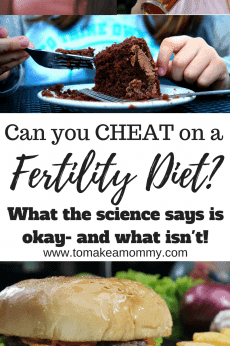 Eating a clean, nourishing, organic fertility diet is crucial to fighting infertility. It is just as crucial that you prepare the food in that diet in a kitchen free of toxins! Click here to go straight to all our favorite non-toxic household items! Don’t be overwhelmed by these steps, and just tackle it one at a time! Each time you reduce your exposure you are boosting your fertility! 1. Ditch the plastic. 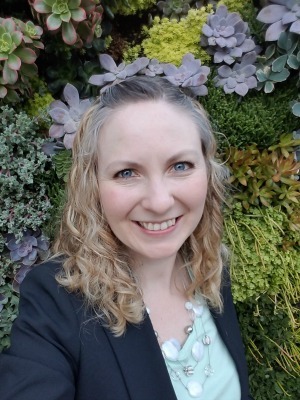 Research shows that most plastics leach BPA-like endocrine disruptors (including phthalates) that are linked to male and female infertility, miscarriage (including early loss), and pregnancy complications. Replace all plastic cooking utensils with wood or food-grade stainless steel. We love our bamboo utensils set, but we also use a number of stainless steel utensils that we can throw in the dishwasher! Recycle or give away all your plastic food and beverage containers. This means you, tupperware. Replace them with glass or high quality food-grade stainless steel containers. For leftover food, we use glass pyrex containers with glass lids so we can put them all in the microwave. You can buy ones with plastic lids, just don’t let the food touch them. 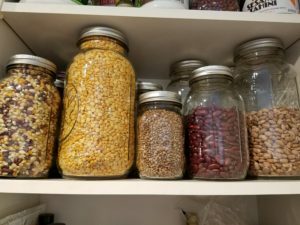 For food and beverage storage we use many different sizes of mason jars, and big pretty stainless canisters for flours and sugars. Don’t forget your cute labels! If you’re on a tight budget, you can also repurpose your old glass peanut butter jars, spaghetti jars, etc. Definitely no more ziplocks for food- use the pyrex or cute little unbleached paper bags. I also use organic cotton baggies for some items. Even better- make your own reusable baggies! It is better for the environment too! Also- we love these stainless containers for carrying snacks around– as they are much lighter than the glass! Never ever, ever, put plastic in the microwave or dishwasher. Heat causes these toxins to leach out of the plastic and into your food or beverage. If there is any plastic you must keep in your kitchen, wash by hand in lukewarm water. Stop using plastic water bottles. Water that sits in plastic is at risk for leached endocrine disruptors- nasty fertility-harming chemicals that reduce your ability to conceive and increase the risk of miscarriages. Drink your water out of glasses, and when on the go use a glass or high quality stainless travel bottle- I love Lifefactory’s glass bottles and Klean Kanteen’s stainless bottles. Watch out for metal water bottles which are actually aluminum, which has been linked to Alzheimer’s and decreased male fertility. 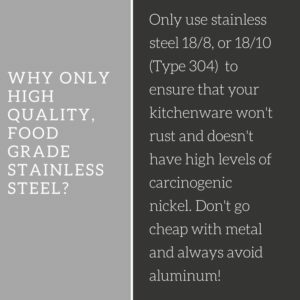 Your stainless should be 18/8 or 18/10 food grade stainless steel. Don’t buy food or beverages that come in plastic bags or containers. Buy fresh food and food packaged in glass. When your only option is to buy in plastic, move the food into glass or stainless containers when you get home. For fresh produce, bring along your own organic cotton produce bags so you can skip bagging in plastic bags. Stop eating anything that comes in a can. Almost all cans are lined in fertility-harming BPA. The very few brands that aren’t (Eden Organics, for example) still have alternative liners that leach other fertility-harming endocrine disruptors into your food. Acidic foods like tomatoes are the worst. Make whatever you can fresh- for example we eat lots of beans and cook them from scratch quickly and easily in our Instant Pot (you can also cook slow in a much cheaper Crock Pot). For items you simply can’t cook fresh, buy in glass containers (you can find every kind of tomato- diced, stewed, paste, etc. in glass if you look hard enough). Foods that come in tetra paks (the little cardboard boxes) are better than cans, but not as good as glass. The polyethylene layer in the tetra pak that touches the food hasn’t been shown to leach endocrine disruptors as of yet, but I wouldn’t trust it completely. Choose fresh or glass whenever possible. Ditch your Keurig. Get rid of all plastic contraptions that touch boiling water, like a keurig or plastic coffee maker. We use a completely plastic free electric kettle and it is absolutely amazing (and even made in the US!). Neither of us drink coffee any more, but we have a glass drip setup that we use with unbleached paper filters when guests come to visit. You can read more about why we ditched coffee and our non-toxic set-up in this post! 2. Get rid of anything “non-stick.” The chemical that makes nonstick pots and pans nonstick is perfluorooctanoic acid (PFOA) and it has been linked to infertility in men and women and in developmental delays in babies. You absolutely do not want to skip this one! Replace all your cookware with glass, ceramic, cast-iron, or high-quality stainless steel. Avoid anything with aluminum touching the food, and avoid low quality stainless steel, which has a risk of carcinogenic nickel. To test your stainless cookware do the vinegar test. We cook with All-Clad Tri-Ply and Lodge Cast-Iron, and we bake in Pyrex. Enameled cast iron is also okay, and we love the few Le Creuset items we have. Just be aware that Lead Safe America has found lead on some Le Creuset items. You don’t have to buy a stainless cookware set as expensive as our All-Clad is (we were lucky to receive it as a wedding present)! Just make sure the set you get is 18/8 or 18/10 food grade stainless and you are good! A more affordable set ranked highly on Amazon is Cusinart set, which many of my readers have purchased! Don’t use a traditional rice maker, almost all of them are non-stick. Instead, use the miraculous Instant Pot which is not only a rice cooker but is also a pressure cooker, slow cooker, sauteer, and so much more! We now own ttwo Instant Pots (I know we are crazy)- so we can cook beans and rice at the same time! 3. Throw away all your harsh cleaning products. This includes surface cleaners, dishwashing soap, dishwasher detergent, and hand soap. You should only use natural products that are free of bleach, ammonia, phthalates (any ingredient that says “fragrance” or “parfum” has phthalates), parabens, sodium laureth sulfate, and triclosan. See my full write-up on the topics here. Also- never buy an “antibacterial” soap again- the main chemical “triclosan” is an endocrine disruptor linked to lower sperm quality. If you don’t feel like reading ingredients then check your product on the Environmental Working Group’s Guide to Healthy Cleaning. For cleaning products we primarily use Dr. Bronner’s for everything. We just buy a huge jug of unscented and dilute it appropriately for whatever cleaning we are doing. You can add essential oils if you like, or leave it unscented. You can also clean almost your whole house with lemon, baking soda, and a little water! You can buy a reuseable glass spray bottle for storing your cleaning solutions! Alternatively, you can buy brands like Seventh Generation, Earth Friendly or EcoMe. For hand soap I used to use A La Maison which I adore, but which is very expensive. Now, I we buy for half price at TJ Maxx and Marshalls. What I really should be doing, however, is making my own from castille soap and essential oils and putting them in a metal or glass hand-pump. BUT, sometimes it’s the little things that matter, and using these lovely toxin-free hand soaps in pretty bottles makes me happy. 4. Filter your drinking water. You need plenty of clean, filtered water each day to maximize fertility. Unfortunately, most tap water has fertility harming toxins such as volatile organic chemicals, pesticides, herbicides, and other chemicals from industry and agricultural run-off. Tap water also has heavy metals, endocrine disruptors which hurt fertility, and fluoride, which (though controversial) may affect fertility. 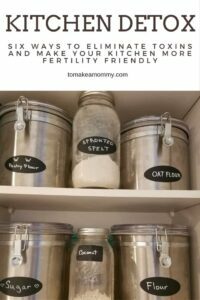 Here is my post on filtering water for fertility, complete with the dangers of unfiltered water to the reproductive system, and my recommendation on how to chose a water filter based on your budget. Avoid the pitcher filters as they are plastic and don’t filter out VOCs, heavy metals, flouride, or endocrine disruptors. Reverse osmosis filters do a great job removing toxins, but waste on average 6 gallons for each they produce. Yikes! Just get yourself some kind of filter with carbon filter technology, which should filter out most of the threatening toxins. If you can handle an on-the-counter option, people love the Berkey filters. If you are like us and prefer an under-the-counter option, I think the absolute best one is this under the counter water filter by Pure Effect Filters that we use and love. They also have an on-top-of-the-counter option! Bottom line: Get something with a carbon technology, and all parts are BPA, PVC, and phthalate free. 5. Buy organic! The most important things to buy organic are meat, dairy, eggs, leafy greens, berries, and other produce that is high in pesticide residue. The “Dirty Dozen” of produce that should always be bought organic includes for 2016: strawberries, apples, nectarines, peaches, celery, grapes, cherries, spinach, tomatoes, sweet bell peppers, cherry tomatoes, and cucumbers. If you’re on a budget or have limited access to organic the “Clean Fifteen” are safer to buy non-organic. They include for 2016: avocados, sweet corn, pineapples, cabbage, frozen sweet peas, onions, asparagus, mangoes, papayas, kiwi, eggplant, and honeydew melon. 6. Only eat safe toxin-free fish. The best are those high in fertility friendly omega-3 fatty acids and include Wild-caught Alaskan Salmon, herring, other wild salmon, sardines, and black cod. Fish that should be avoided due to toxins (mercury, PCBs, and dioxins) include swordfish, ahi and bigeye tuna, mackerel, orange roughy, tilefish, marlin, Chilean sea bass, shark and bluefish. Limit albacore and yellowfin tuna to less than three servings per month. Should I throw away my microwave? I know some fertility coaches who advocate for throwing away your microwave. I haven’t seen any studies that back this up, and I’m not sure we could manage without our microwave. Since we cook almost everything from scratch, and have busy, busy lives, our sanity and well being depends on quickly reheating healthy leftovers. I also avoid most raw foods, so again, I can’t be cooking every meal every day, especially when I go to work. If you are at a point in your life where you think you might be able to exist without a microwave, by all means go for it. If not, I wouldn’t worry about it! To be honest, however, I do stand far away from the microwave when its on! If you are like us then the costs of switching everything in your house to non-toxic really add up. For us, it was completely worth it. We were expecting to spend at least $15K on an IVF cycle if the doctors allowed it, and if they didn’t or it failed, we would have been looking at much more than that on a donor egg cycle (or multiple, as on average it takes around 3 tries to be successful). We threw things in the trash, ordered like crazy from Amazon, and didn’t look back. 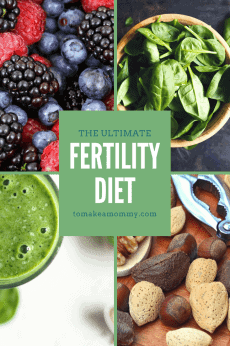 Of course, if you’ve read my story you know that I was pregnant in about two months after I started clearing the toxins out of our lives, eating a clean, whole foods organic diet, and following a daily mind-body fertility practice. So for us, the one time costs of replacing tupperware with glass pyrex, buying organic, and purchasing a few meditation MP3s were nothing compared to the amount we were prepared to spend. My advice is this- you need to do this. Whether or not you are just starting your baby journey, or whether you have been struggling for years. You need to do this for yourself, for your spouse, and for your future children. You want your family to live in a house that is as free as possible of chemicals that are harmful. Now is the time to make the switch. I think it was one of the great gifts of my baby journey that I learned about all this and we cleared away all the toxins we could from our house. Obviously not every kitchen item will be available in a safe glass or high quality stainless option. We find some items so essential to our daily lives that we make compromises. When we do, we make sure that the plastic item is a hard, food-grade plastic, and we never, ever put it in the dishwasher or microwave. This means, for example, that the cups to our NutriBullet (which we adore) are always washed by hand in luke-warm water, and are replaced annually. We have sent multiple emails to the company politely requesting that they develop cups made out of glass. If you love your NutriBullet, why don’t you send them an email as well asking for a glass option? Are you ready to make the commitment? Did I miss something important? Leave a comment and tell us what you have already done, and what new steps you are going to take! I love this! So important! I am all about getting rid of all the toxins! Thanks Caroline! 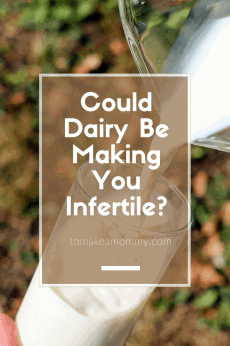 It is important for everyone- not just those of us struggling with fertility challenges! I was wondering what cleaning product(s) were you using or would recommend for cleaning floors (we have tile flooring). Go for the Dr. Bronner’s! ½ c. of soap in 3 gallons of hot water! Hi Anna, I love your blog and materials. I’m in the process of overhauling our kitchen and noticed one big issue…we love ziploc bags LOL. My husband recently purchased reusable bags for me to carry my lunch food. What are your thoughts on these? I get worried about any sort of chemical or plastic coating inside them. Do you have a preferred brand? Good question! Gotta ditch those ziplock! Best is to make your own organic cotton food baggies or buy off etsy. Second best is a mass produced reuseable bag. This is a great post with lots of these brands- https://mindfulmomma.com/reusable-snack-bags/ We use bumkins! But we also use stainless bento containers for food, and glass pyrex!